Beginning today, five Hawaii Army National Guard Black Hawk helicopters will temporarily take over medical evacuation missions normally provided by the 25th Infantry Division. Here, a Black Hawk medevac helicopter picks up a litter patient. Beginning today and for the next three months, five UH-60 Hawaii Army National Guard Black Hawk helicopters will temporarily fly the medical evacuation missions normally provided by the 25th Infantry Division. However, Hawaii Army Guard pilots will be able to provide help for critically injured residents for only 13 hours a day -- 11 a.m. to midnight, seven days a week. That is instead of the 24-hours-a-day Oahu emergency helicopter transport service provided by Army aviators and helicopters over the past 32 years. The Hawaii National Guard hopes to contract a civilian provider by July. The state House Finance Committee will hear a bill on Monday that was passed by the Senate on March 7 that gives the state health director the authority to hire a private, government or military helicopter to provide the emergency transportation service. The bill also requires the city to match any money that the state allocated for the service. The Army suspended its service because the 12 Black Hawks and crews belonging to the 25th Infantry Division's Charlie Company (Medical) of the 25th Combat Aviation Brigade will be deployed to Iraq this summer along with 7,000 other Schofield Barracks soldiers. The unit is expected to return in October 2007, but an Army spokeswoman said yesterday no determination has been made if the service will be reinstated. For the next three months, five Black Hawks and aviators and air crews, belonging to the Hawaii Army National Guard's Bravo Company, 168th Aviation and normally stationed at Lyman Field in Hilo, will be on state active duty at Wheeler Army Air Field to provide the 13-hours-a-day service. Two years ago, when 4,500 Schofield Barrack soldiers were sent to Afghanistan, only some of the 25th Division's medevac Black Hawks were deployed. Hawaii Army National Guard officials said yesterday a certified city medical intensive care technician will be on every Hawaii Army Guard Black Hawk medevac mission. Since 1974 the Army's Military Assistance to Safety and Traffic, or MAST, program has maintained one Black Hawk on a Wheeler ready pad with a crew of four and a radio-telephone operator 24 hours a day, seven days a week. The Army crews had only 10 minutes to plan a route to the emergency scene, evaluate weather conditions and find out the patient's condition and location. The use of Army medevac helicopters was always determined by city paramedics on the scene who used the severity of the injuries and the time needed to transport victims to the nearest hospital as their guide. 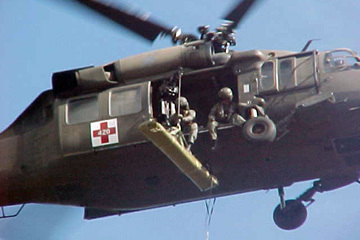 Each Army Black Hawk medevac helicopter could carry up to six litter patients and was equipped with a portable defibrillator, equipment to monitor patient's oxygen level, burn kits, spinal injury stabilization boards, and medical supplies sufficient to handle three patients. The Army said the MAST program flew more than 7,100 patients during more than 6,000 aeromedical evacuation missions. Since 1974 it has averaged 15 missions a month.